You will feel like having embarked on a ship, with portholes overlooking the sea. You will be able to admire the waves, sunrise and moon while lying on your bed... Change of scenery ensured ! Wish for some fresh salt air ? Climb up the watchtower, 4 meters higher. This hut offers neither water nor electricity. It is equipped with dry toilets. A five litres tank is at your disposal. The bed will be ready when you arrive. During the week : 119 euros per night, including breakfast. week-ends (fridays, saturdays, sundays), public holidays, school holidays : 139 euros per night, including breakfast. Availabilities and booking online (secure payment). For birthdays, parties, Christmas... an original and memorable present to offer! One or two nights in a tree hut... together with aperitif kits. 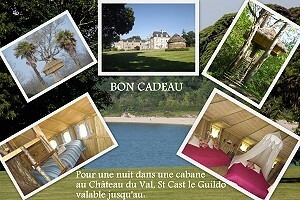 To contact us, dial 02 96 41 07 03 or write to chateau@chateauduval.com, or order online (secure payment). Find our tree huts on Facebook!